The culture and heritage of the AmaMpondo tribe - SABC News - Breaking news, special reports, world, business, sport coverage of all South African current events. Africa's news leader. AmaMpondo tribe in the Eastern Cape has always attracted the attention of ordinary citizens. From language to the form of dress and rituals, AmaMpondo are one of the twelve Xhosa-speaking tribes mostly found along the Wild Coast. As descendants of AbaMbo, they migrated south from the Great Lakes around the 1570s, travelling through Tanganyika to Zambezi where they settled for a long time before moving south to present day South Africa. Historian and chairperson of the Correctional Supervision and Parole Board, Mzwandile Maraqana, says the tribe originally settled in the Central Africa. “Pondo people were originally settled in the Central Africa, in what was known as Nyasaland, but in the 15th Century they moved together with other tribes, south of Central Africa before splitting in Mpumalanga. The Pondos together with the Zulus moved to areas around Durban or Northern Zululand. Due to some differences, Pondos moved south of Umzimkhulu River and settled there with Mthatha River to the west and Umzimvubu River in the east,” says Maraqana. 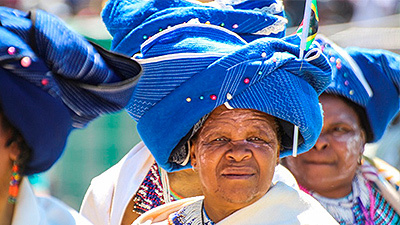 Members of this tribe are divided into AmaMpondo aseQaukeni which include Bizana, Lusikisiki and Flagstaff and AmaMpondo aseNyandeni which include Libode and Ngqeleni. They were divided after King Mqikela defied an agreement between his father, King Faku and then Cape governor, Sir Peregrine Maitland of the British government. “In 1844, Faku signed a treaty with the then governor Sir Peregrine Maitland which was recognising Faku as the King of all the Pondos. There was a condition in the treaty that said Faku should allow free trade between the colonialists into his territory. He agreed because there was also a stipend that he was paid for doing that well. But when his son Mqikela took over, he did not want to honour that agreement and as a result he was punished by the British government by splitting his kingdom into two,” Maraqana explains. AmaMpondo have their culture and customs of which circumcision and ukuthwala are part of. The circumcision custom has stirred a lot of controversy amongst the Pondo nation, with some arguing that the custom is for Xhosas after hundreds of young boys have died in initiation schools. “Pondos practised circumcision during the rule of Faku and Mqikela, but the only time when Pondos stopped doing that custom was during the wars between our brothers in the north and us which resulted in the suspension of that custom so that we are able to face the enemy. The unfortunate part is that when it has been returned during the period of the rule of Marhelane, the custom has now been commercialised,” Maraqana says. There is also a custom called intonjane, a passage of girls to womanhood. Girls are kept for seven days in a hut, smeared with a red ocre on their faces and bodies. A grass called inkxopho is scattered on the floor for other girls to sit on, while intonjane sit behind grass mats. Their mothers and boys are not allowed to enter this hut. “On the 3rd day of the ritual, three goats are slaughtered and their skins used to make traditional bracelets called ingqwamba for the intonjane, while some elder women from the village are singing and dancing in front of the hut,” Traditionalist Mangwanya Thoko from Lusikisiki says. This past weekend, AmaMpondo celebrated Pondo Culture and Heritage festival at Lwandlolubomvu Great Place in Ntabankulu, in commemoration of chief Ntsikayezwe Sigcau, son of king Jongilanga Sigcau. Chief Ntsikayezwe played a significant role in youth and rural development. Event organiser and daughter of the late Chief Ntsikayezwe Sigcau, Stella Sigcau the 2nd, say the event was meant not to unify only the Pondos but the nation as a whole. “It means celebration of our culture, promotion of our culture and preservation of our culture. It also means unity in diversity because it’s not just about AmaMpondo, it’s about uniting other tribes or other cultures and also those cultures to share their traditions and heritage with us,” Sigcau says. Song and dance are also part of Pondo culture. Young men are divided into three categories which include iintsizwa, young men who never went to school, iindlavini-those who went to school but dropped out and amatshawe the graduates. While they dance, other young men and women sing for them. AmaMpondo are perceived as stubborn and resisted the Bantu Authorities Act that proposed the segregation and transfer of blacks to their independent homelands. That resistance led to AmaMpondo Revolt between 1960 and 1962. “Pondos are not stubborn but the fact of the matter they are very principled in terms of guarding and protecting their land. If you touch their land then you are touching the rest of the Pondo nation. We have a history of resistance. You can see what happened in the Ngquza Hill when the then government was trying to control us in terms of demarcating our land, fencing our land, reducing our stock under the so called rehabilitation of the land. Pondos resisted and said this time around we are not going to allow that to happen,” Maraqana says. AmaMpondo have their language called IsiMpondo, a mixture of IsiXhosa and IsiZulu which Maraqana describes as being distinct from isiXhosa. Maraqana says amaMpondo were not part of the commission of 1883 established to determine the education as well as a language that must be taught at schools. The tribe is now calling for IsiMpondo to be made one the official languages of South Africa.